As you’re probably aware, it’s quite popular right now to go on a detox. One type of detox is for the body, where the goal is to flush out the bad things that affect a person’s physical body and put in more good things. Another type of detox is where a person who is addicted to drugs or alcohol goes through a special treatment in an effort to stop using these destructive items. But there’s another type of detoxing that many of us are not aware of, even though I believe we all need it to some degree. This would be the detox for the soul. In the Bible, David was referred to as a man after God’s heart (see Acts 13:22). Yet David knew he had issues going on in his own heart that hindered him from being all that God wanted him to be. In Psalm 51:10 David wrote, “Create in me a clean heart, O God, and renew a steadfast spirit within me.” A few verses later he continued on with, “Restore to me the joy of Your salvation.” David was aware that in his heart, in the depths of his soul, there were things that were keeping him from being totally clean. He knew he had toxins that were harmful to his own well-being and the well-being of those he influenced. Just as David dealt with heart issues, so you and I have been impacted year after year by the world around us. 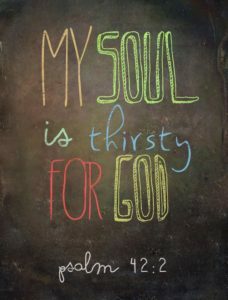 Many of this world’s “soul-toxins” have made their way into our hearts, causing us to struggle in various areas of life. God can help us to cleanse our heart and soul, but we must first admit the need for this cleansing and then be open to do what needs to be done to receive this inner detoxing. Are you challenged to stay “up” and be happy? Have you accepted depression or despair in your heart? Have you given up your dreams and desires? Are you angry with your life or circumstances? Do you feel hopeless and helpless? There are many other questions we could also ask but these are a good start. If your answer to one or more of these questions is yes, then it’s time for you to let God begin a detoxification on the inside. The Bible tells us many times over that a healthy mind is the key to a healthy life. Scriptures like Romans 12:2, Ephesians 4:22-24, and Philippians 4:8 remind us that what we think about on a regular basis greatly affects how we live. To get something different on the outside, we must put something different on the inside. But who can help you think in a way that would be healthy to your heart and soul? I think the perfect one to help is Jesus! For the next week, I challenge you to daily ask the One you call your Lord to also be your Mental Coach. Ask Him to help you in your thinking, to make you aware of thought patterns that are hindering your life, and to help you focus your thoughts on things that will bring benefit and strength to your life. If you’ll do this for just one week, I believe He will do what you’re asking of Him. I also believe you’ll see some positive change in your life. Although everything won’t change in a few days or a week, you’ll be on the right path for making last changes that you’d like to see.